I’ve mentioned here before that I try to eat local food whenever possible, but it’s not always possible. Vegetables, fruit, and meat are available from reasonably local sources, but milk and grains are a challenge. 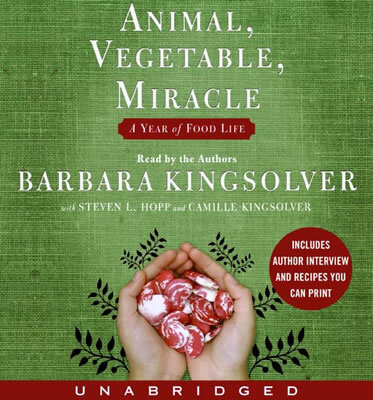 So I was interested in reading Animal, Vegetable, Miracle: A Year of Food Life and learning how Barbara Kingsolver and her family managed to live off local food for a year. Fans of Barbara Kingsolver will be glad to know that she wrote most of the text. Her husband Steven adds sidebars that discuss the scientific and environmental aspects of industrial and local food economies. Daughter Camille provides information on nutrition, as well as meal plans and recipes, which are available at the Animal, Vegetable, Miracle Web site. All three read their own sections on the audiobook. Although I liked this book in the end, I wouldn’t recommend it for someone who isn’t already on the local food bandwagon. Early in the book, I found the tone to be, well, preachy. Every excuse people have for not eating local is dismissed. You think it’s more expensive to eat local? Well, it isn’t. You think you can’t grow food in the city? Well, you can. No, you don’t need that cereal or that macaroni and cheese—and don’t even think about those bananas. Barbara even goes on a bit of a tirade about how vegetarians, Jews, and Muslims can make their dietary preferences known to their hosts without being considered rude, but local food eaters cannot. There’s a lot about her attitude in the early chapters that is off-putting and even downright annoying. But as the book goes on, Barbara softens her attitude and fesses up that they do make exceptions to their “all local, all the time” rule—exceptions that go beyond the single non-local item each family member was allowed when the project began. They eat at friends’ houses without making demands, and they keep a stash of boxed mac and cheese in the house for friends of Lilly, Barbara’s youngest daughter. They also provide more hard data about the costs of local food. And in the interview at the end of the audiobook, Barbara says outright that for some people, only small changes are feasible, but if everyone made a small change or two, the effects could be tremendous. And one or two small changes might lead to more small changes. Start where you can and see what follows. For most people, that’s the most sensible approach, and I hope readers won’t get so turned off by the absolutism in the early chapters of this book that they abandon the local food idea entirely. Some local food is better than no local food. I’m sure that the Kingsolver/Hopp family would agree with me there. This is my 5th book from 2007 and my 20th overall for the Countdown Challenge. I only have two 2007 books left and 25 books overall. This entry was posted in Audiobooks, Food, Nonfiction. Bookmark the permalink. I read this book a while ago now and seem to have forgotten the smug nature of the beginning…I really liked this book overall. But I agree, small changes are what I can make, too. I’d like to put in a garden but even thinking of the time required makes me tired! And I disagree with Kingsolver’s early assertion that “vegetarians, Jews and Muslims can make their dietary preferences known to their hosts without being considered rude”. As a vegetarian that has not always been my experience. Victoria–Smug is exactly the right word for the early chapters of the book. It was very nearly a fatal flaw for me, but she seemed to get more realistic as the project went on. The sidebars helped with some ideas for smallish changes, but until listening to the interview, I got the feeling that she didn’t think small changes were enough. Melanie–On balance, I really did enjoy the book, but for the first couple of discs I was really unsure. The passage about vegetarianism and religious dietary restrictions really bothered me both for the reason you mention and because something about the tone made it sound as if she didn’t think these dietary concerns were as valid as her own. It was very weird. I enjoyed this book. It inspired me to learn to make cheese!